The biggest challenge for product managers? A few weeks ago, I invited Mind the Product readers to take part in a brief survey with a simple goal: to identify the biggest challenges product managers face in their role. I’m sincerely grateful to the 47 of you who provided your thoughts, many of which were detailed and insightful in their own right. And while this wasn’t a scientific study, the results are directionally valuable and, for what it’s worth, consistent with my experiences and those of my colleagues. 77% of responses came from the United States, with the remainder spread across the UK, Germany, India and others. Respondents came from a variety of company sizes, ranging from start-ups with under $1M in annual revenue to businesses with over $100M in annual revenue. Aside from a few facts about their company and role, we asked respondents to answer a single, open-ended question: What’s your #1 single biggest product management challenge right now? There were no multiple choice options; respondents could write as much or as little as they wanted. Even before we finished bucketing the answers by theme, it was clear what the primary challenge on most product managers’ minds is: setting roadmap priorities without real market feedback. Across all respondents, 49% product managers said that their foremost challenge is being able to conduct proper market research to validate whether the market truly needs what they’re building. 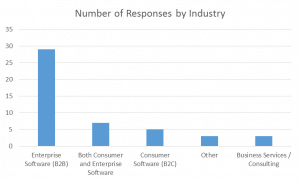 When we look at only the responses from enterprise software PMs, this figure jumps up to 62%. As product managers it’s our job to make sure that the company is building the right product, but many (possibly a majority) of us don’t feel like we’re doing that. In fact, nearly all of the responses in this bucket expressed not having time to do market validation at all. It’s a little sobering when you think about how much time, money and energy is being wasted building features that the market doesn’t want or need. It also tells me that the career development of many product managers is slower than it ought to be. A great product vision comes from knowing your customers so intimately that you can design a product that perfectly meets their needs. Unfortunately, one of the biggest challenges of managing product at software companies is that the pressure to move fast leads people to substitute their own experiences for market validation. Product failures often trace back to a misunderstanding or outright ignorance of what users (and buyers) really care about. If these survey results are even partly reflective of the broader set of product professionals (especially in the B2B space), then we all live in a marketplace full of sub-optimal products. As a software user, that’s a little sad. But as a product manager it should excite the hell out of you. Why? Because if most companies do a poor job of vetting what the market wants, it means they’re vulnerable to better solutions built by those who better understand the market. And it is getting easier to do this. If I could give one piece of advice to any product manager, it would be to choose a way to ask the market directly for feedback and just do it – right now. If your website gets significant traffic, website polls can be a great way to get quick feedback on customer needs. If you want to talk to people who aren’t customers yet, Google Consumer Surveys lets you spin up a survey fast and collect results for as little as $0.10 per response. If you have an email list, you can ping them too with any number of tools. Ask for forgiveness rather than permission and just start doing it. Just as there are opportunities everywhere for better products based on better customer knowledge, the world will never have too many product managers who are experts at sourcing quality feedback. The ability to capture market feedback and translate it into a coherent vision is the thing you need to be great at. Whenever you find yourself debating feature prioritization with colleagues, be the person who says, “Let’s test this.” To paraphrase Jeff Bezos, nothing flattens a hierarchy like customer feedback. Your boss might disagree with your opinions, but it’s a lot harder to brush off direct customer feedback. I’ve used expert networking firms like Zintro and other, pricier ones before with some success. I’ve actually had the most consistent results cold-messaging people on LinkedIn who looked like my target users and paying them to let me pick their brains for an hour or two. The most successful product managers tend to be the ones who understand their market best. Invest your time accordingly. Christian Bonilla is the founder of UserMuse, which connects product and UX teams with hard-to-find subjects for user testing and product feedback. He writes regularly for UserMuse and Fast Company.